Let your phone’s batteries run out. Leave your laptop at home. Let the only updates you send to friends be on the back of a postcard. We’ve scoured the globe for 10 spots that will help you leave the Internet—and all your Facebook friends, Twitter followers, and email alerts—behind, if only for a few days. Instead, recharge your own batteries by floating down a river in Thailand or basking in the spectacular Alaskan wilderness. Yandup Island Lodge in Guna Yala (also known as Kuna Yala or San Blas Archipelago) has a lot: gorgeous beaches, comfortable cabins, even 24-hour solar-powered electricity, all on its own private island. But unless you bring your own Wi-Fi hotspot, any "liking" you do will have to be in person. So give the thumbs-up to overwater cabins and exploring nearby uninhabited islands. Rooms handcrafted from earth and stone are lit by beeswax candles at the Adrere Amellal eco-lodge near Siwa Oasis in Egypt. Explore the dunes of the Great Sand Sea, lounge by the pool, and feast on locally sourced and mostly organic meals. You'll have to wait to share those pictures, though; these earthen rooms aren't even wired for electricity, let alone Wi-Fi. 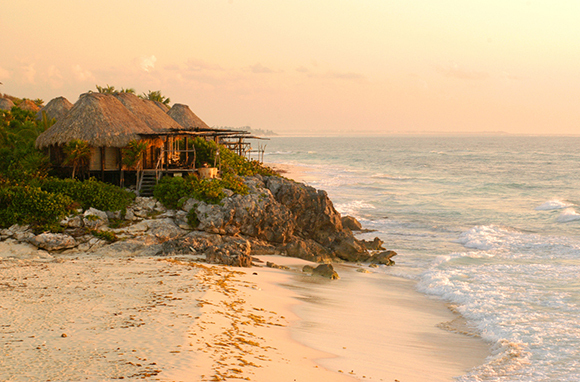 Trade electricity for days of bright blue Caribbean Sea and nights by candlelight at Azulik in Tulum. Its 15 private villas are decidedly rustic, though you can indulge in a bit of luxury by booking a holistic treatment at the resort's Maya Spa. It's an experience worth writing home about, which is what you'll have to do, since the rooms don't have phones. You're about as likely to get service from a paperweight as you are from your cell phone at Ultima Thule Lodge, set a hundred miles from the nearest road, deep in the spectacular and isolated Wrangell-Saint Elias National Park & Preserve. Accessible only by small plane, this wilderness lodge is perhaps the ultimate escape from Facebook. The fabled Hana Highway sets the stage for the unplugged vacation that awaits you at the Travaasa Hana on Maui. The coastal drive is best taken at the same leisurely pace exemplified at this "experiential resort." Rooms are appointed to give guests peace and quiet, without the intrusion of radios, clocks, and TVs. Wi-Fi is available in common areas, but wouldn't you rather have a traditional Lomilomi massage, or perhaps take a stand-up paddling lesson, or go on a fruit-tasting tour? Facewhat? Your electronic device is machina non grata at the Maine Huts & Trails' three backcountry huts (with a fourth opening next month). Depending on the season, visitors hike, mountain bike, cross-country ski, or snowshoe between huts. The huts feature home-cooked, locally sourced meals, comfortable beds, and bathrooms with hot showers. Adventurers are welcomed, but cell phones and other electronic devices are not: The organization asks that you power them down "not only to improve the experience for all of our hut guests but also to conserve battery life, as you will not be able to charge them during your stay." 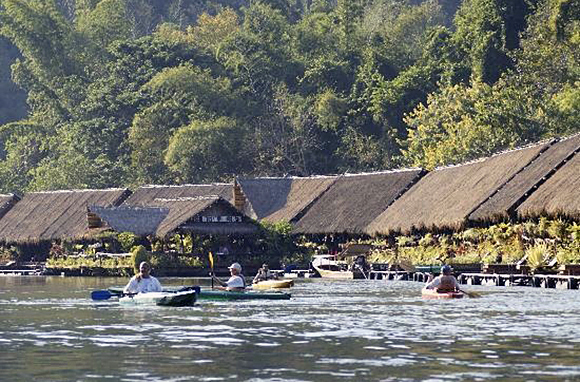 Laptops and phones can't swim, but you'll be able to, at the River Kwai Jungle Rafts resort in Kanchanaburi, Thailand. Floating bamboo rooms are lit by lanterns, and the resort shuns air-conditioning in favor of the cooling effects of the river passing beneath. Rooms have en suite bathrooms and outdoor decks with hammocks and sunbathing beds. Rest, relax, and restore. That's the aim of Rockhouse in Negril, Jamaica. The clifftop boutique hotel helps guests unwind by offering yoga, two award-winning restaurants, a spa, and water activities like snorkeling and diving. The hotel's 34 rooms are peaceful Wi-Fi-free zones, which means you'll just have to content yourself with stargazing before bed. Tough life, right? Trade the computer keyboard for the Florida Keys at Little Palm Island Resort & Spa on Little Torch Key. The five-and-a-half-acre island is dotted with 30 oceanfront suites, all without Internet, televisions, or even telephones that reach the outside world. If you need to check in occasionally, complimentary Wi-Fi is available in the Great Room. But unless Facebook is the one item you'd take with you to a deserted island, you're better off letting the rest of the world melt away and enjoying the perfect white-sand beach, the quiet pool, or the view from your verandah. Let's face it, a place that advertises its cabins as featuring indoor flush toilets and propane lights is unlikely to make Internet access a priority. That's certainly the case at the Fairmont Kenauk, nestled in one of North America's largest wilderness habitats. Individual cabins serve as home bases for couples, families, and groups looking to get away from it all to fish, hunt, canoe, and hike. But never fear; if you really need a civilization fix, there are phones and the other trappings of modern life at the nearby Fairmont Le Chateau Montebello.